The signing of the pact key outfit Nationalist Socialist Council of Nagaland- Isaac-Muivah is the culmination of over 80 rounds of negotiations that spanned 16 years with first breakthrough in 1997 when ceasefire agreement was sealed. 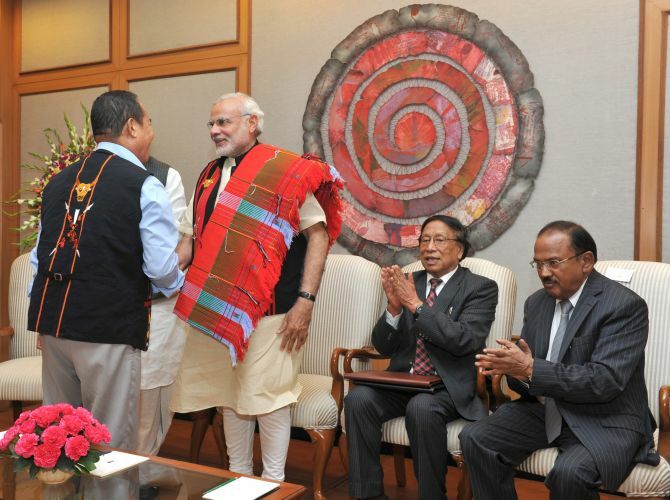 With an aim of ending insurgency in Nagaland, the government on Monday signed an accord with key outfit Nationalist Socialist Council of Nagaland- Isaac-Muivah which Prime Minister Narendra Modi described as a "historic" step to usher in peace in the state. The pact was signed in the presence of the prime minister, Home Minister Rajnath Singh and National Security Adviser Ajit Doval by the outfit's leader T Muivah and government's interlocutor R N Ravi at the PM's residence in New Delhi. While the NSCN-IM is the biggest Naga rebel group which has been maintaining the ceasefire, another faction led by S S Khaplang continues to indulge in violence and was believed to be behind the deadly attack on army in Manipur in June that left 18 soldiers dead and 18 injured. 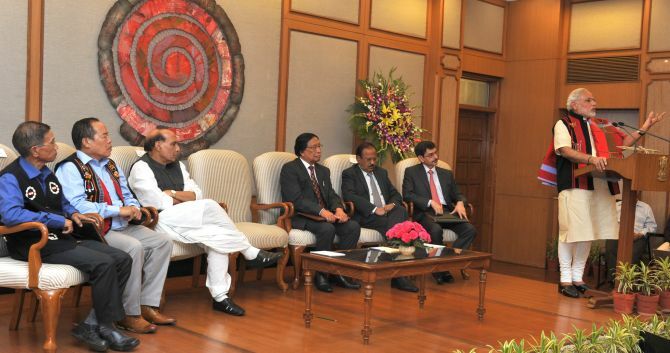 It was not immediately clear whether the agreement meets the main demand of the NSCN-IM for integration of all Naga-inhabited areas in the northeast across Manipur, Arunachal Pradesh and Assam. Details and execution plan within this framework agreement will be released shortly, official sources said after the accord in which Doval played the central role. He added, "We will not only try to heal wounds and resolve problems, but also be your partner as you restore your pride and prestige." Muivah said the government and Nagas were entering a “new relationship" but added that "beginning from now, challenges will be great." 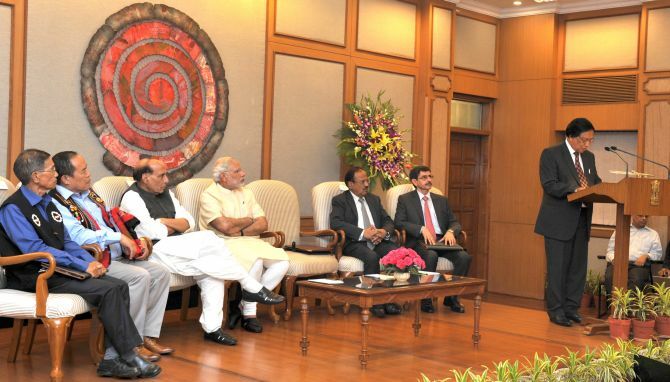 Before the agreement was signed, Modi spoke to leaders of various parties including former Prime Minister Manmohan Singh, Congress' Mallikarjun Kharge, Samajwadi Party chief Mulayam Singh Yadav, Bahujan Samaj Party's Mayawati, Nationalist Congress Party supremo Sharad Pawar and Communist Party of India-Marxist general secretary Sitaram Yechury. He also spoke to West Bengal Chief Minister Mamata Banerjee, her Tamil Nadu counterpart J Jayalalithaa besides the Nagaland Governor Padmanabha Acharya and Chief Minister T R Zeliang. He also called up DMK leader M Karunanidhi and Janata Dal-Secular leader H D Deve Gowda. "Today’s agreement is a shining example of what we can achieve when we deal with each other in a spirit of equality and respect, trust and confidence; when we seek to understand concerns and try to address aspirations; when we leave the path of dispute and take the high road of dialogue. It is a lesson and an inspiration in our troubled world," the PM said at the signing ceremony. 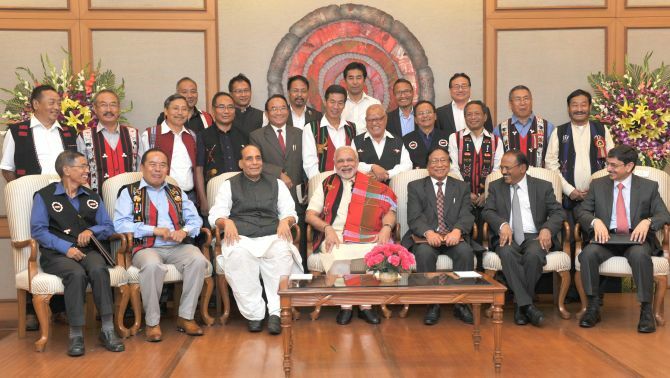 NSCN-IM said a framework agreement signed today was based on the "unique" history of Nagas and recognising the universal principle that in a democracy sovereignty lies with the people. The Naga rebel group said the attitude of Nagas towards India changed considerably when the BJP government took "realistic" steps in recognising the 'unique history and situation of the Nagas' on July 11, 2002 and it demonstrated the desire for a lasting and honourable political solution of the issue. 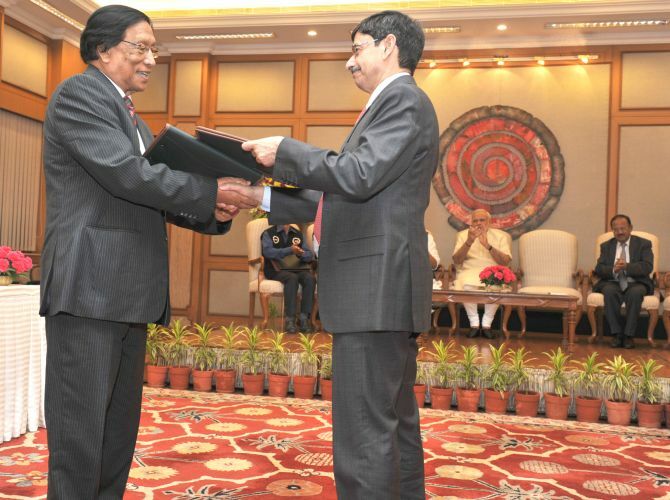 "Better understanding has been arrived at and a framework agreement has been concluded basing on the unique history and position of the Nagas and recognising the universal principle that in a democracy sovereignty lies with the people," NSCN-IM general secretary Th Muivah, who signed the pact, said in a statement. The rebel group, which has been fighting for a sovereign Naga homeland for decades and has finally given up on that, said that after decades of confrontation and untold sufferings, the Nagas responded to have political dialogue with the government of India in view of the acknowledgement that the government will seek peaceful solution leaving aside military solution to Naga issue. 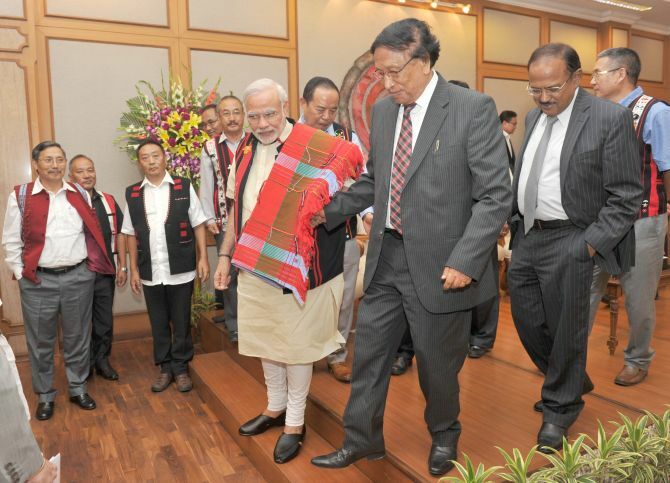 In the statement, the NSCN-IM applauded the leadership of Prime Minister Narendra Modi, who was present when the agreement was signed, saying the pact was concluded due to the "statesmanship and steely resolve" shown by him towards finding a final political solution. 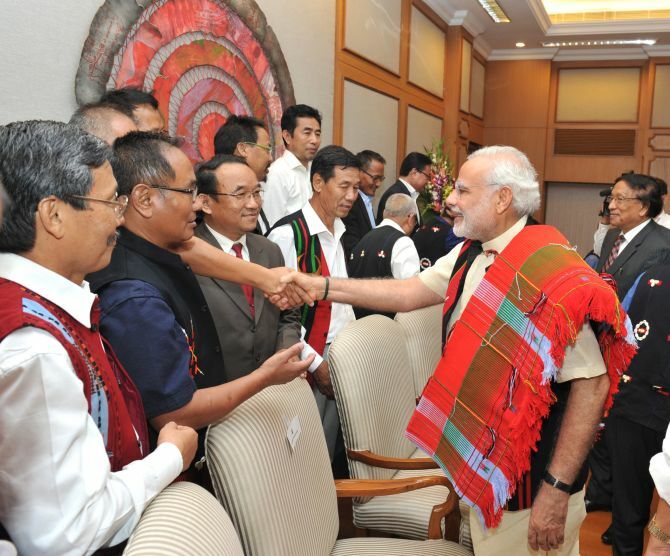 FAQ: What is NSCN-K? Who is SS Khaplang?